I have had so many opportunities to live, work and visit very exciting places. It is hardly ever planned and usually just comes together. People sometimes ask me how I do the things I do, because it tends to look effortless and simplistic. But nothing could be further from the truth. Each wonderful journey has been preceded, or even accompanied by intense amounts of pain and sacrifice. The kind that is personal, the kind that maybe wouldn’t be such a big deal to anyone else but it is to me. I have cried more than I’d like to admit over things that were hard or difficult or just plain lonely. But my God, has it been worth it. The places I’m able to go, the people I am able to meet. My life is blessed in ways that I cannot even begin to understand. Since I was 7 or 8 years old, I decided I wanted to change the world. No one tells you how lonely and difficult it is, but they don’t tell you how truly amazing it is either. I imagine Sophia, a regal lady liberty look alike, with a crown of stars and symbolic thingamajigs in her outstretched hands, long life on the left and riches and honor on the right. Then I imagine her as just Sophie, the tall, nondescript aunt that lets the nephews and nieces scour the pockets of her big brown overcoat for toys and treats, or maybe silver and gold and rubies in this case. Proverbs says she is a tree of life, and I imagine her as an old southern tree, her roots spread out and her branches giving green goodness to the birds and squirrels and children brave enough to climb. I picture myself hugging that tree, letting Sophia’s bark warm under my skin, and figure if God ever got married it would be to her, Sophia the tree, and they would be one with the earth and sky. I suppose they already are, in a way, married and connected and one. When Solomon was a little boy, God came to him and asked him what he wanted. More than anything, Solomon said, he wanted to be wise. God was so impressed with Solomon he decided to give him wisdom along with all the things he could have asked for and didn’t- riches, glory, and honor. Wisdom is worth it. Not only should we be searching after her, but she is actively looking for us as well. Proverbs tells us she is in the streets, calling after us. Solomon wanted her. So do I. She’s not something you claim as your own, or use for the sake of using, or any of the other things we tend to do to good women on this seemingly god-forsaken planet. Sophia is not owned, she is given, and given through herself. Nothing is required of her, and yet she requires everything of us. For to be wise, we learn humility, love, patience and strength. We learn to wait and listen, and know her pockets go deeper than we could have ever imagined. I rediscovered this picture in my files the other day. This was taken in January of 2012, while the city of Iquitos experienced its worst flooding in the last 100 years. One particular neighborhood was completely submerged. People cut doorways into their roofs and laid down new floorboards three feet or so away from the rooftop. Entire families lived in the rafters, cooking, cleaning, and sleeping there for months as they waited for the waters to recede. The man in the baseball cap is tall and lanky. He crawled into a small roof space where the other man had been cooking soup over a small stove. He offered him some bags of rice, and then asked if there was anything he could pray for. The man said yes, and asked for prayer for his health, as the flooding had caused a rise in the mosquito population and more and more people were dying of dengue fever. 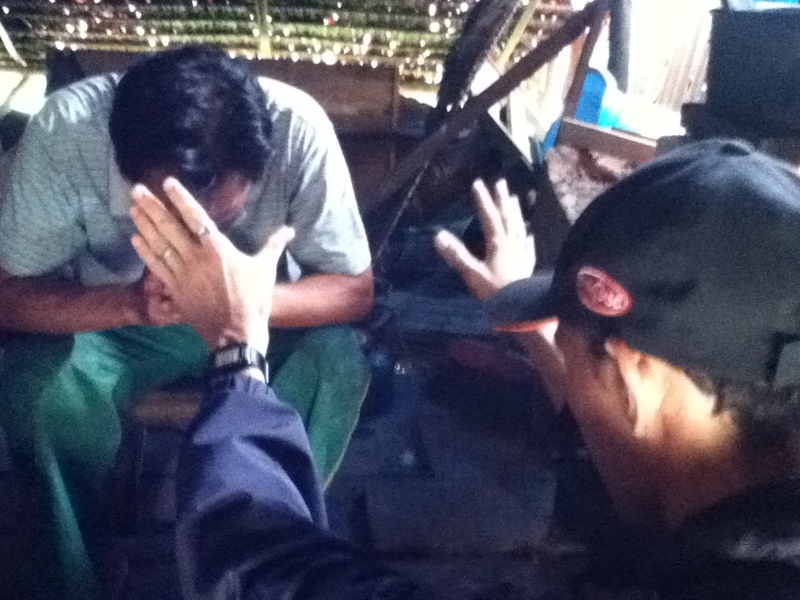 The two men stayed crouched in the roof space and prayed together. I found Sophia here not only because of the connection between strangers, but the wisdom to offer prayer after asking first. People’s needs might be different than what you expect, and reaching out to make a connection on their terms is truly wise. Everyone needs something, and while you may not be able to offer it to them, listening to someone’s needs and agreeing to hope with them is one of the most powerful things you can do. Please be with me as I travel. I as journey from one place to another allow me to hear your voice. Let my journey be a blessing to those I meet and let me see the God in each and every one I encounter. Bless me with the ability to feel your presence strongly when I am afraid, or when the road is rough. Give me the confidence to know that even when I cannot feel your presence, that I am always enfolded in the love of the universe.